The battle between print and digital media is in full force: will the Kindle defeat bound books? Emails slay the tradition of letters sent by post? Digital and social media marketing quash print ads? Though the Internet has infiltrated the way most people live their lives in the 21st century, traditional advertising still persists. We can’t deny it: blogs are abound, email marketing abundant, and social media an engaging platform that creates a dialogue with the consumer. While internet marketing is attractive because of its affordability, potential for virality, and interactive nature, print has its perks. Here are a few scenarios highlighting when and why you might consider opting for print advertising over digital, or integrating the two for a doubly effective approach. Get your Hands on This: Literally. 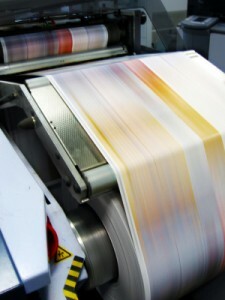 Print campaigns are palpable in that the consumer can touch them – and keep them around for weeks, months, even years. Though sponsored ads and posts on social media can make them more visible in News Feeds and on Walls, the average, unpaid social media update can get lost in the noise. Reliable Source: Print ads carry credibility that is hard to defeat. Though the Internet is a huge source of research, the fast-paced nature of the web means that oftentimes the information published there is less thoroughly planned and researched than it is in print. Lasting Impressions: The web can be a total deluge of information, which translates to less time spent lingering on behalf of users. While drop-off rates online can be high, studies show that consumers are more likely to engage for an extended period on paper than on a screen. Peace and Quiet: Since more and more business are, indeed, looking to online forms of advertising to promote their brand, goods, and services, print ads are less crowded, giving your company the opportunity to shine in the space. Don’t let promotional print materials lose out entirely in the war for effective advertising: both forms are worthy contenders in the fight to help expand your business. Which format is best to reach your target audience? The market research specialists atour Baltimore research facility, Observation Baltimore, can help you to create campaigns that produce results by helping you to understand consumer needs, perceptions, and desires. For more information, call us at 410-332-0400 or click here! If you’d like to participate in one of our focus groups, please sign up at http://www.observationbaltimore.com/get-paid-baltimore-maryland-get-paid-cash-opinion-baltimore-md/. This entry was posted on Wednesday, February 20th, 2013 at 6:44 pm. Both comments and pings are currently closed.